The tricycle or ‘cycle rickshaw’, as some people now call it, combines the characteristics of bicycle and rickshaw. Tricycles could be found in Asia and around the world, but they differed significantly in design and appearance. In Malacca and Singapore, it was a carriage with a passenger seat on the left side of the rider. In Bangkok, the rider was pedaling at the front and the passenger sat on the seat at the back. Like many other cities such as Hanoi, Jakarta and Penang, Hong Kong saw the use of a tricycle with the load situated in front of the rider. In Hong Kong, the official English term for this mode of transport is “tricycle”. Locally known as saam-lun-che (三輪車, Cantonese for “three-wheeled vehicle”), it remains part of Hong Kong’s past that is increasingly forgotten. Privately kept for individual use before the Pacific War, it came to be available for public hire to transport passengers during 1942-45 when motorized transport facilities broke down. But the tricycle trade swiftly vanished after the Pacific War, not surprisingly because of the rapidly growing volume of other forms of traffic. There were two different types of tricycles in Hong Kong: one for cargo-carrying and the other for passengers. The latter type had a cushioned seat to provide greater comfort for passengers. The other type had a storage box and a flat platform mounted between two parallel front wheels. The platform was set very low, to keep the center of gravity low and to ensure that the height of the load would not block the view of the rider when the vehicle was being propelled. Moreover, it was not unusual for tricycles to have front and rear wheels of different sizes. The licensing process was one of the means by which the Hong Kong government controlled the use of vehicles on the roads. The exact date of the first licensing of the tricycle is unknown, but under regulations laid down by authorities in 1933, a vehicle licence and a driver’s licence were both required in respect of each tricycle, the annual fees for which would be $6.00 and $0.30 respectively (Hong Kong Blue Book, 1933). According to police figures, the total number of tricycle licences issued during the year 1939 was 1,744 as against 1,345 in 1938, 1,129 in 1937, 993 in 1936, 797 in 1935, and 959 in 1934. 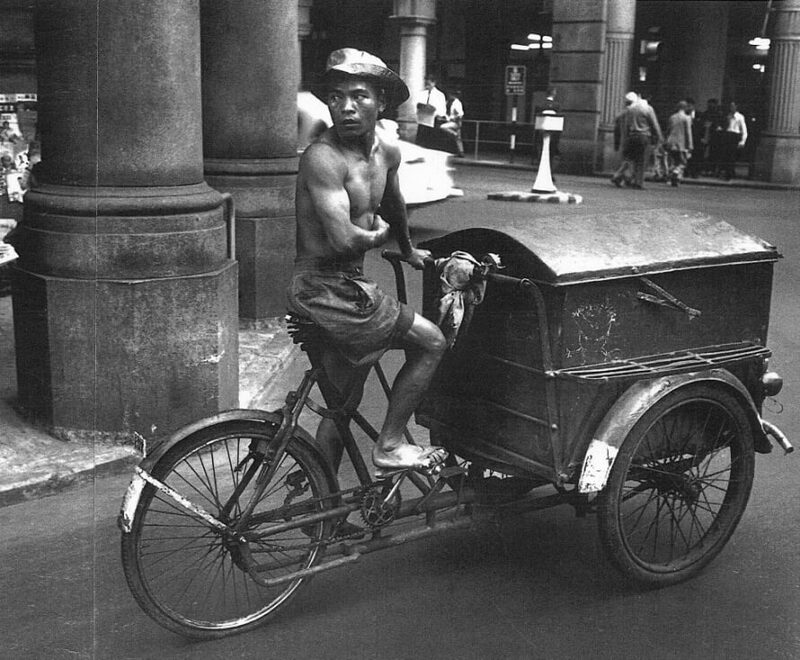 In pre-1941 Hong Kong, the tricycle was for individual use and not for carrying passengers for hire. A court case noted that “a tricycle, containing a quantity of sweets and confectionery, near Haiphong Road” was knocked over by a motorist (The China Mail, 27 November 1935). In another court case, a jobless man faced time in jail for stealing a tricycle from Mr. F. Donald’s residence at Lincoln Road (The Hong Kong Daily Press, 29 January 1938). In yet another case, a man used a knife to slash “the tyres of a tricycle” which belonged to a stall, causing damage to the extent of $10 (The Hong Kong Daily Press, 16 January 1940). The tricycles were often assembled by local mechanics. 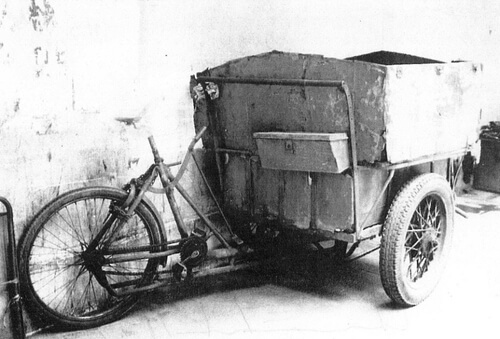 Two bicycle shops told the citizenry in their advertisements posted in The Hongkong and Macao Business Classified Directory, 1940 (below) that they manufactured cargo-carrying tricycles in addition to the distribution of spare parts and sale of branded bicycles from abroad. The two shops were, namely, “Chung Hing” (中興) at 13 Hillier Street in Central and “Hop Hing” (合興) at 34 Johnston Road in Wanchai. It is quite interesting to note that when the above-said Directory was issued in 1941, one of the two tricycle makers had opened a Kowloon branch at 750 Nathan Road and advertised itself as a cargo-carrying tricycle company: “合興三輪貨車公司”, see below. Such a change is revealing, indicating that there was a continuing demand for additional tricycles. In fact, a local Chinese newspaper noted that a rising number of tricycles were being stolen in Shamshuipo (深水埗), Kowloon, in early 1941 (Tien Kwong Morning Post 天光報, 13 February 1941). After almost exactly 100 years of British rule, Hong Kong was conquered by the Japanese on Christmas Day, 1941, and remained in Japanese hands until August 1945. Hong Kong under the Japanese rule was quite different from what it was like under the British. During the years of Japanese presence, when motor vehicles and fuel were unobtainable there was a revival of human and animal transport. Even horse carriages began to re-appear on the streets. According to wartime newspapers, the tricycle became a public (for-hire) vehicle to transport passengers after the cancellation of certain bus services in Kowloon in 1942-43. At that time, many tricycles sprang up in the city districts of Kowloon where they were carting people around and did so speedily; besides, it was not unusual that up to four passengers squeezed into one tricycle (Heung Tao Yat Po 香島日報, 15 January 1943). The fares for riding tricycles were paid in military yen (hereinafter, MY), a currency which was imposed by the Japanese, an arbitrary exchange rate of MY 1 = H.K. $4 being fixed on 24 July 1942. Many riders were not the persons who actually owned the tricycles. On a good day, they made MY 10 after payment of MY 3 to MY 4 for vehicle rental. At times, they had to forfeit part of their earnings for paying the costs of damage incurred to the tricycles (Wah Kiu Yat Po 華僑日報, 29 August, 18 September, 6 October 1943). The Chinese newspapers in Japanese-occupied Hong Kong also gave evidence that the making and renting of tricycles was often a monopoly of bicycle shops. The Heung Tao Yat Po (15 January 1943) noted that the riders would pay bicycle shops MY 1 per day to rent the tricycles. The Wah Kiu Yat Po (6 October 1943) said that enterprising individuals started to build tricycles and made them available for hire, but the tricycles did not have an overhead canopy to shield the passengers from sun or rain. 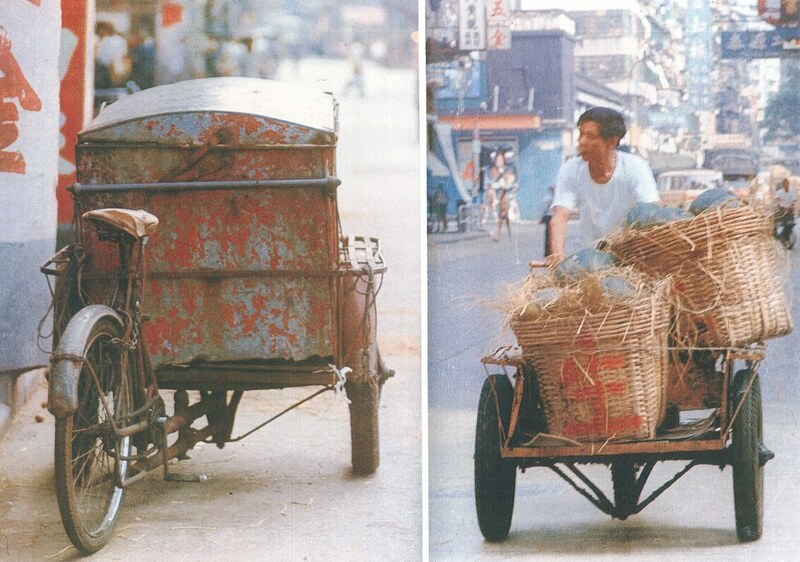 An eye-witness of those days, who was living in Mongkok until the end of the war, recalls that the wartime tricycles were often assembled by bicycle shops (Wu Wai-tim, interview, 31 August 2013). The “Around Town” column of The Hong Kong News (a Japanese-controlled, English-language newspaper which was published throughout the occupation) reported on 6 October 1943 that for the convenience of passengers, “a large number of tricycles and bicycles have been allotted for service outside the Sun Sun Hotel [新生酒店] and Po Hing Theatre [普慶戲院] in Katorido-dori [Japanese transliteration of “Nathan Road”], Kowloon. These vehicles should prove a boon to those who require urgent transportation facilities”. The Japanese conquerors were in favor of having more tricycles on the streets, as their use would not only save gasoline but would also alleviate the transport difficulties caused by the cancellation of bus and tramcar services. But, as time dragged on the tricycle traffic soon got out of hand. The tricycles were providing service with negotiated fares and the fares charged might be exorbitant, causing intending passengers a great deal of trouble. In 1943 the Kowloon Bicycle and Tricycle Cooperative Association was formed at the behest of the Japanese, so as to put the public hiring of bicycles and tricycles under control. Wartime newspapers reported that its inauguration ceremony was held during the second week of October 1943 when decisions for the improvement of hired transport services were taken at a meeting held at its office at Tai Nam Street (大南街), Shamshuipo. The decisions were: (i) to fix an official schedule of fares for different types of vehicles; (ii) to set aside places where the riders would wait for passengers; (iii) to assign officials at the parking places to preserve order; and (iv) to require the riders to wear uniforms and badges for identification purposes. That same year, 1943, a number of Chinese and Japanese residents of unknown background jointly expressed an interest to form a company to operate a scheduled tricycle service that would operate on fixed routes with set fares. This service would comprise a fleet of tricycles specially built to carry two adult passengers. From Tsimshatsui (TST) the service would start at 7am daily while from Mongkok the first tricycle would leave at 7.20am. The last tricycle would depart TST at 11.30pm and from Mongkok at 10.30pm. Regular runs at 15 to 30 minutes intervals would be maintained. The fare would be MY 0.20 per trip (The Hong Kong News, 4 December 1943). The Kowloon Bicycle and Tricycle Cooperative Association was replaced in August 1944 by a new organization called H.K. Island, Kowloon & New Territories Bicycle and Tricycle Syndicate, to deal with matters relating to the pedal vehicles for public hire. Messrs Tang Shiu-woon (鄧肇垣), Wong Dai-wah (黃棣華) and Chau Lum (周霖) were appointed as the divisional heads of the syndicate Glimpses of Old Hong Kong: Sedan Chairsin different geographic areas. Amongst the ‘guests’ present included Major Shiozawa, the head of the police of the Japanese gendarmerie, who gave orders that all members of the Syndicate must “comply with the rules and regulations of the Syndicate”. This article was first published in the Indhhk email Newsletter 9 sent out on 9th November 2013. Excellently well-researched and very interesting. I fully agree with your comments Di, CM has done a great deal of research into all forms of non-motorised transport in HK. Superb photos, and other images, as well. You’ll be pleased to hear that Part Two of his Tricycle Industry article, continuing its history post WW2, will appear in Newsletter 10 which will be published on the website in early January 2014.